Our Family room is rust, gold and bronze so I tend to decorate with those colors in this room. I used 2 small trees and decorated them both the same. They sit on a sofa table. I used copper birds, rust and gold Butterflies and leopard prints. Love this! I visited one of my favorite stores and they displayed an upside down Christmas tree, all decked out in copper, bronze and gold. I often change this out! I used a large urn with pretty ornaments. I added tall Xmas cones and reindeer. and Straight Stitches. Stop and visit to see beautiful trees..
Be sure to visit all of the other bloggers and get really inspired! Hi Linda! Your tree and decorations are bee u tee ful!! Wow! I'm just amazed at how gorgeous your home is!! Ahh, so pretty! Lucky you with the doors open! I've got snow! I like the upside down tree on the candelier idea...most of all I like the ornaments hanging down the way they have them...neat idea! How beautiful! But as I say every time I come over here, I expect nothing less from you. I love your style. It is always so "rich" and elegant looking. Hi Linda! Wow! Your decorations are beautiful and love those colors! It just makes everything look warm and rich. You have a beautiful home! Upside down tree under chandy a great idea! I just adore the colors....those amber glass ornaments on the chandelier are to-die-for!!! Thanks for stopping by Janie's Porch and leaving your sweet comment. Yep, I am waiting on some paperwork to be straightened out so I can take the exam for my license....grrrrrr. Seems to be taking forever and I'm ready to get rockin' n rollin' in real estate!!! You have a terrific sense of style and a beautiful blog! Can't wait to explore further. Your home is absolutely beautiful all deck out for Christmas. I love your color scheme. Thanks for visiting and leaving such a sweet comment. I've enjoyed my visit and I too have become one of your followers. Those pictures of your house are gorgeous. I love the bronze colors you used on the trees in your family room. I agree, that upside down tree was to die for. Thanks for dropping by and leaving your kind comments. It was nice to hear from you. Love the bronze and copper! You've done a wonderful job. I love the top of the tree, kind of shaggy! I like the affect it creates! Linda it is all oh so elegant and gorgeous. WOW! I adore every single thing I see here. Beautiful job! Bronze has become my new favorite this year. PS Your blog design is stunning too! Hey Pretty lady!! Im FINEALLY getting to visit all my FAV blogs and friends! I SWEAR you and I have the SAME Tastes!!!!!!!!!!! Everything is just BEAUTIFUL!!! Im just gonna PACK and MOVE IN! Gotta room for me? We would have TOO MUCH FUN!! Hi there- just wanted to let you know I highlighted you at this weeks Feathered Nest Party! I highlighted your chandy tree in my post today! I'm so jealous that I didn't do this this year. Next year tho...I'm definitely taking a page from your book and doing it! WOW! This is a brilliant idea! 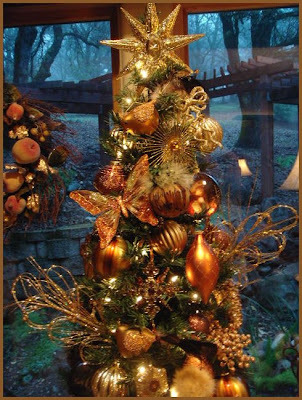 The combination of copper, bronze, and gold are so gorgeous for your Christmas decoration theme! Maybe it would be good to add some accents with a touch of vintage idea for your Christmas décor theme.